Karl Korsch on the philosophy of Lenin, written in 1938. This article first appeared in Living Marxism IV:5 (November 1938) a council communist journal edited by Paul Mattick. It had first been written for the Institute for Social Research (Frankfurt School) journal Zeitschrift fur Sozialforschung but was not accepted. A French translation was published as an appendix in the Spartacus Editions version of Lenin as Philosopher, and it was reprinted in the Merlin Press english language edition. In the latter it is wrongly attributed to Paul Mattick. Some additional remarks to Anton Pannekoek's recent criticism of Lenin's book "Materialism and Empirio-Criticism." There is a striking contrast between the impression produced in the minds of West-European revolutionaries by those short pamphlets of Lenin and Trotsky which appeared in poorly translated and poorly printed editions during the final stage and the aftermath of the war, and the response called forth in Europe and U.S.A. by the belated appearance, in 1927, of the first extra-Russian versions of Lenin's philosophical work of 1908, on "Materialism and Empirio-Criticism". Those earlier pamphlets on "The Marxist Theory of the State and the Tasks of the Proletarian Revolution" and on "The Next Tasks of the Soviet-Power" were eagerly studied by the European radicals as the first reliable news from a victorious proletarian revolution and as practical guides for their own impending revolutionary uprisings. They were, at the same time, ignored, falsified, calumniated, despised, and-frightfully feared by the bourgeoisie and its reformist and Kautskyan-centrist backers within the Marxist camp. When Lenin's philosophical work appeared the whole scene had changed. Lenin was dead. The Russia of the Soviets had been gradually transformed into just another state immersed in the competitive struggles between the various "blocks" of powers which had been formed in a Europe apparently quickly recovering from the war and from the deep but transitory economic crisis resulting from the war. Marxism had been replaced by Leninism or, more recently, by Stalinism which was now no more regarded primarily as a theory of the proletarian class struggle but rather as the ruling philosophy of a state, different but not entirely different from such other state philosophies as fascism in Italy and democracy in the U.S.A. Even the last remnants of the proletarian "unrest" following the war had flickered out with the crushing defeat of the English general strike and miners' strike in 1926 and the bloody termination of the first and so-called "communist" phase of the Chinese revolution. Thus, the European intelligentsia was quite ready to accept; along with the hitherto unknown earliest philosophical writings of Marx which were now published in a princely fashion by the Marx-Engels-Lenin-Institute in Moscow, the equally "piquant" philosophical revelations of his great Russian disciple who, after all, had swept the empire of the Czar and until his death maintained an unchallenged dictatorship there. 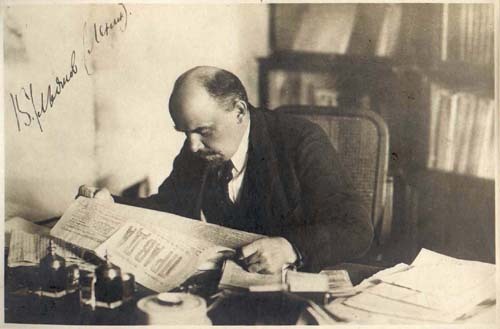 But those strata of the West-European proletariat who had been the first and the most serious and persistent readers of Lenin's revolutionary pamphlets of 1917-20 had apparently disappeared from the scene. They had been replaced in the public eye either by those all-adaptable careerists of Stalinism who form the only stable sector of the rapidly shifting membership of all extra-Russian Communist parties today, or as typical of recent English C.P. development, by progressive members of the ruling class itself and its natural supporters within the better educated, most cultured, and well to do strata of the old and new intelligentsia who have practically replaced the former proletarian membership. Revolutionary proletarian communism seemed to survive only in isolated individual thinkers and in such small groups as the Dutch Council Communists from which the pamphlet under discussion originated. We might expect that Lenin's book when it was finally made available to the West-European and American public for the express purpose of spreading there those philosophical principles of Marxism which form the basis of the present Russian state and of its ruling Communist party would have met with almost universal applause. Nothing of the kind has happened. No doubt the philosophy of Lenin as expressed in that book is infinitely superior, even from a strictly theoretical viewpoint, to those scattered crumbs from the systems of bygone counter-revolutionary philosophers and sociologists that have been formed into the semblance of a philosophical system of fascism by Mussolini, with the help of the former Hegelian philosopher, Gentile, and other intellectual aides-de-campe. It is incomparably superior to that huge mass of trite everyday talk and senseless trash which figure as a politico-philosophical Weltanschauung in the "theoretical" work of Adolf Hitler. Thus the people who could find novelty and wisdom in the ideas of Mussolini and discover sense in the vapourings of the German leader, certainly should not have felt any difficulty in swallowing also that considerable amount of misinterpretation, misunderstanding, and general backwardness which mar the theoretical value of Lenin's philosophical attempt. Even those few who today are acquainted with the works of the philosophers and scientists discussed by Lenin in 1908 and with the developments of modern science generally might have been able to dig out of this work of Lenin (to speak in the favourite style of its author) that "gem" of clear and persistent revolutionary thought which is "hidden in the rubbish" of unqualified acceptance of the obsolete "materialist" concepts of a past historical epoch and equally unqualified abuse of some of the most genuine attempts of modern scientists to promote the theory of materialism. Nevertheless, the response of the progressive bourgeois intelligentsia at large to the belated propaganda of Lenin's materialist philosophy must have proved disappointing to the Russians, who had shown on several occasions that they were by no means above desiring some applause for their pet achievements in matters of theory even from such Marxistically "unholy" quarters as the philosophical and scientific circles of Western Europe and America. There was not so much open hostility as indifference and. even more awkward, just among those whose applause would have been most cherished, a kind of polite embarrassment. Nor was this embarrassing silence disturbed, for a long time, by any vigorous attack from that left radical Marxist minority which formerly had so violently assailed every attempt of Lenin and his successors to transform the political and tactical principles successfully applied by the Bolsheviks in the Russian revolution into universally valid principles of the proletarian world revolution. The remaining representatives of that leftist tendency were very slow to raise an equally fierce attack against the analogous attempt of a world-wide application of Lenin's philosophical principles as the only true philosophical doctrine of revolutionary Marxism. Here at last, thirty years after the first (Russian) publication of Lenin's book and eleven years after the appearance of its first German and English translations -- is the first critical re-examination of Lenin's contribution to the materialist philosophy of Marxism, written by one who undoubtedly and for many reasons is better qualified for this particular task than any other contemporary Marxist. Even so there is little hope that this first important criticism of Lenin's philosophy will reach even that relatively small minority of revolutionary Marxists to whom it is mainly addressed. It is published under an almost impenetrable pseudonym and, most characteristically, up to now in the shape of a stencilled manuscript only. There was, then, a considerable lag of time on both sides of that world-wide struggle between Western European Marxist left radicalism on the one hand and Russian Bolshevism on the other, before the opposed camps discovered that their political, tactical and organisational contrasts depended, in the last instance, on those deeper principles which had hitherto been neglected in the heat of the practical fight and thus could not be thoroughly elucidated without going back to those underlying philosophical principles. It seems as if even here old Hegel was right when he said that "the bird of Minerva begins its flight when the day is gone." It does not follow, however, that this last, "philosophical phase" of the social movement going on in a given epoch should be, at the same time, the highest and most important phase. The philosophical fight of ideas is, from a proletarian point of view, not the basis but just a transitory ideological form of the revolutionary class struggle determining the historical development of our time. Nevertheless, this is only one, and perhaps not the most important aspect of Pannekoek's critical revision of Lenin's work. The main weakness of Lenin's attack on Machism is not its general unfairness, outright misrepresentation of the essentially materialistic approach underlying the new positivistic philosophy, and complete unawareness of the real achievements made since the days of Marx and Engels in the field of modem physical science. The main weakness of Lenin's "materialistic" criticism of what he called an idealistic (solipsistic, mystical and, in the last instance, plainly religious and reactionary) tendency hidden in the pseudo materialistic and scientific theories of Mach and his followers, is his own inability to go beyond the intrinsic limitations of bourgeois materialism. Much as he talks of the superiority of "modern" Marxist materialism over the abstract philosophical and mainly naturalistic approach of the early bourgeois materialists, he still conceived this difference between the old and new materialism as a difference not in kind but in degree. At the utmost he described "modern materialism" as founded by Marx, as a materialism "immeasurably richer in content, and incomparably better grounded than all previous forms of materialism." He never conceived of the difference between the "historical materialism" of Marx and the "previous forms of materialism" as an unbreachable opposition arising from a real conflict of classes. He conceived it rather as a more or less radical expression of one continuous revolutionary movement. Thus Leniin's "materialistic" criticism of Mach and the Machians, according to Pannekoek, failed even in its purely theoretical purpose mainly because Lenin attacked the later attempts of bourgeois naturalistic materialism not from the viewpoint of the historical materialism of the fully developed proletarian class, but from a proceeding and scientifically less developed phase of bourgeois materialism. This judgement of Lenin's materialist philosophy of 1908 is corroborated by the later developments of Lenin's philosophical theory which are not dealt with here. In the last parts of the pamphlet Pannekoek deals with the historical and practical significance of the peculiar theoretical aspects of Lenin's materialist philosophy as discussed in the preceding chapters. He fully acknowledges the tactical necessity, under the conditions in pre-revolutionary Czarist Russia, of Lenin's relentless fight against the left bolshevik, Bogdanov, and other more or less outspoken followers of Mach's ideas who in spite of their good revolutionary intentions actually jeopardised the unity and weakened the proven revolutionary energy of the Marxist party by a revision of its "monolithic" materialistic ideology. In fact, Pannekoek goes somewhat further in his positive appreciation of Lenin's philosophical tactics of 1908 than seems justified to this writer even in a retrospective analysis of the past. If he had investigated, in his critical revision of Lenin's anti-Machist fight, the tendencies represented by the Russian Machists as well as those of their German rnasters he might have been warned against the unimpeachable correctness of Lenin's attitude in the ideological struggles of 1908 by a later occurrence. When Lenin, after 1908, was through with the Machist opposition which had arisen within the central committee of the Bolshevik party itself, he regarded that whole incident as closed. In the preface to the second Russian edition of his book, in 1920, he mentioned the fact that he had "no opportunity to examine Bogdanov's latest works," but was quite convinced, by what he had been told by others, that "under the guise of `proletarian culture' Bogdanov is introducing bourgeois and reactionary views." Yet he did not deliver him to the G.P.U. to be instantly shot for this horrible crime. He was quite content, in those pre-Stalinist days, to leave the spiritual execution to the good and reliable party-worker whose article he annexed to his book. Thus we learn from the faithful Leninist, V. I. Nevsky, that Bogdanov had not only unrepentantly persisted in his former Machist errors, but even had added to them a new and more glaring crime of omission. It is a "curious circumstance," reports Nevsky, that in all his writings on theoretical topics and on the problems of proletarian culture published during the period of the dictatorship of the proletariat, Bogdanov never mentioned a single word about "production and the system of its management during the dictatorship of the proletariat, just as there is not mentioned a word about the dictatorship itself." The fact proves, indeed, the unreformed and unreformable character of that "idealistic" sinner against the very principles underlying the materialist philosophy of Lenin and his followers. We do not want to imply here that Bogdanov's definitions of the physical world as "socially organised experience," of matter as "nothing else than resistance to collective labour efforts", and nature as the "unfolding panorama of work-experience," contain a really materialistic and proletarian solution of the problem raised by Marx in his Theses on Feuerbach of 1845 when he said that "the chief defect of all hitherto existing materialism was that the given world, reality, sensuousness, was conceived only in the form of the object or of contemplation but not subjectively as human sensuous activity or as revolutionary practice. The real point is that we should not under any conditions, either today or even retrospectively, make the slightest concession to that basic fallacy inherent in Lenin's philosophical fight against Machism and faithfully repeated by his minor followers in their struggle against the materialistic attempts of scientific positivism today. This fallacy is that the militant character of a revolutionary materialist theory can and must be maintained against the weakening influences of other apparently hostile theoretical tendencies by any means to the exclusion of modifications made imperative by further scientific criticism and research. This fallacious conception caused Lenin to evade discussion on their merits of such new scientific concepts and theories that in his judgement jeopardised the proved fighting value of that revolutionary (though not necessarily proletarian revolutionary) materialist philosophy that his Marxist party had adopted, less from Marx and Engels than from their philosophical teachers, the bourgeois materialists from Holbach to Feuerbach and their idealistic antagonist, the dialectical philosopher Hegel. Rather he stuck to his guns, preferring the immediate practical utility of a given ideology to its theoretical truth in a changing world. This doctrinaire attitude, by the way, runs parallel to Lenin's political practice. It corresponds to his unshakeable jacobinic belief in a given political form (of a party, a dictatorship, or a state) which has been found useful to the aims of the bourgeois revolution of the past and can therefore be trusted as useful to the aims of the proletarian revolution as well. Both in his revolutionary materialist philosophy and m his revolutionary jacobinic politics, Lenin hid from himself the historical truth that his Russian revolution, in spite of a temporary attempt to break through its particular limitations in connection with the simultaneous revolutionary movement of the proletarian class in the West, was bound to remain in fact a belated successor of the great bourgeois revolutions of the past. It is a long way from Lenin's violent philosophical attack on Mach and Avenarius's "idealistic" positivism and empiriocriticism to that refined scientific criticism of the latest developments within the positivist camp which was published in 1938 in the extremely cultured periodical of the English Communist party. Yet there is underlying this critical attack on the most progressive form of modern positivistic thought the same old Leninist fallacy. The critic carefully avoids committing himself to any school of philosophical thought. He would most likely agree with Ludwig Wittgenstein who in his final phase dealt with all philosophy as a curable disease rather than a series of problems. Yet he bases his whole argument against modern positivism on the assumption that the vigorous fight waged by the old militant positivism against all philosophy was founded on the very fact that this old positivism had started from a distinctly philosophical creed itself. When therefore the latest and in some respects most scientific school of the modern "Logical Positivists" as represented by R. Carnap recently withdrew temporarily from the "philosophical" attempt of constructing "one homogeneous system of laws for the whole of science," and instead concentrated on the more modest task of establishing a "unity of the language of all science"  it would follow from the argument brought forward by their pseudo-Leninist critic that by the same process by which they abandon their former philosophical basis they must necessarily weaken also the crusading ardour of their former anti-philosophical fight. "The positivist who disturbed every philosophical backwater with rude cries of nonsense," says the critics, "is now reduced to saying, in the mildest and most inoffensive manner, nonsense is my language". It is easy to see that this argument can be used in a twofold manner, as a theoretical attack against the confusion between philosophy and science underlying the earlier phases of positivism, and as a practical justification for keeping up that philosophical basis in spite of the belated discovery of its scientific unsoundness. However, the whole argument is not founded on any sound logical or empirical reasoning. There is no need either for the modern bourgeois scientist or for the Marxist to stick to an obsolete (positivistic or materialistic) "philosophy" for the purpose of preserving his full and unbroken "militancy" in the fight against that necessarily in all its forms "idealistic" system of ideas which during the last century under the name of "philosophy" has widely (though not completely) replaced medieval religious faith in the ideology of modern society. Pannekoek, although not fully abandoning the belief in the need of a "Marxist philosophy" for the revolutionary struggle of the modern proletarian class, is aware of the fact that present-day Leninist "materialism" is absolutely unfit to serve this purpose. It is rather a suitable ideological base of that no longer essentially anti-capitalistic but only "anti-reactionary" and "anti-fascist" movement which has recently been inaugurated by the Communist parties all over the world under the new slogans of a "People's Front" or in some cases even of a "National Front." This present-day Leninist ideology of the Communist parties which in principle conforms to the traditional ideology of the old Social Democratic party does no longer express any particular aims of the proletarian class. According to Pannekoek, it is rather a natural expression of the aims of the new class of the intelligentsia i.e., an ideology which the various strata belonging to this so-called new class would be likely to adopt as soon as they were freed from the ideological influence of the decaying bourgeoisie. Translated into philosophical terms, this means that the "new materialism" of Lenin is the great instrument which is now used by the Communist parties in the attempt to separate an important section of the bourgeoisie from the traditional religion and idealistic philosophies upheld by the upper and hitherto ruling strata of the bourgeois class, and to win them over to that system of state capitalistic planning of industry which for the workers means just another form of slavery and exploitation. This, according to Pannekoek, is the true political significance of Lenin's materialistic philosophy. See: Lenin, Collected Works, Vol. XIII, International Publishers. New York 1927: p. 291. See: Lenin. Aus dem Philosophischen Nachlass, Exzerpte and Randglossen. German ed. Berlin, 1932; p. 212. See: M. Black. The Evolution of Positivism. The Modern Quarterly, vol. 1. No. 1. London 1938. See: R. Carnap. Logical Foundations of the Unity of Science, 1938.